Today, “24 East Asian Bistro” and “Glen Anthony Designs” occupy the former Phillips Music Store on East Third St.
Abram Philip’s family had a store in Lithuania, so he knew business. On coming to America in the 1880s, he settled in Bethlehem, perhaps because the people here spoke Pennsylvania Dutch. “He spoke Yiddish and could communicate with the local populace,” grandson Ira Berman says. Abram started as a peddler, then opened a pawnshop. Along the way, he changed his name to Abraham Phillips. 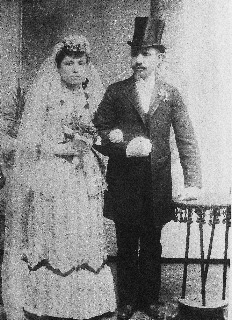 Wedding photo of Abram and Sarah (Joseph) Phillips, 1891. Maurice went on to turn the pawnshop into Phillips Sporting Goods at 13 W. Third St., South Bethlehem. Nephew Ira tells that a customer once wrote that he could not afford to buy a complete set of golf clubs and was amazed to find that every time he went into the store to purchase the next club, it was in stock. He discovered that Maurice had bought the entire set and kept them on hand just for him. 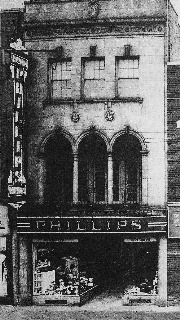 Maurice’s brother, Sol, opened Phillips Music and Appliance Store at 24 E. Third Street. Nephew Ira helped out at the stores, although he says, “My aunts would not call my ventures there ‘work.’” By the time he graduated from high school, he made his first big sale —a clock radio. Apropos, he went on to a career in radio broadcasting sales and management. During the Depression, Sol Phillips advanced credit to his customers. He was later rewarded with customer loyalty after WWII, when appliances were widely available. In those days, South Bethlehem was the place to shop, the sidewalks “packed” [with shoppers] on Saturday nights. When the fortunes of the Steel changed, though, so did those of the merchants on Third St. Sol and Sadie Phillips closed the music store in the 1970s, and Maurice closed his sporting goods store around 1980. “He [Maurice] was so worried about the store because it was empty,” daughter Gail recalls. —Jennifer Lader is a new member of SBHS and of the Oral History Association. She writes for The Bethlehem Press and other publications. Her current project, “People of Mettle: Voices of the Jewish Community of Bethlehem, Pennsylvania,” features personal interviews with fifty people, and presents a view of local and American Jewish history of the past century and more.